Chilliwack is a city of 84,000 people (2016) to the east of Vancouver. It lies in the Fraser Valley Regional District (FVRD). 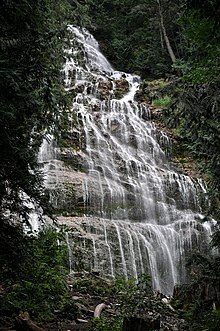 In Halq'eméylem, the language of the Stó:lō First Nations (Aboriginal) communities around Chilliwack and Sardis, Tcil'Qe'uk means "valley of many streams". 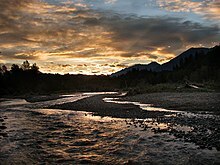 It also lends its name to the Chilliwack River, and group of Aboriginal people, the Ts’elxweyeqw. The city, once a small agricultural town, has become an example of sprawling suburbia and bad city planning. Efforts to revitalize the languishing downtown, and to curb the spread of housing subdivisions into valuable farmland, have proved challenging. The archeological record shows evidence of Stó:lō people in the Fraser Valley, or S'ólh Téméxw, 10,000 years ago. Permanent structures in the Chilliwack area date from around 5,000 years ago. At the time of the first contact with Europeans it is estimated that there were as many as 40,000 people living within Stó:lō territory. In 1857, gold was discovered in the Fraser Canyon. By 1859, over 40,000 gold miners had trekked to the goldfields, most travelling through the Chilliwack area. By the mid-1860s, several farms had grown up around the steamboat landings on the Fraser River called Miller's Landing, Minto Landing, Sumas Landing and Chilliwack Landing. The Township of Chilliwack was incorporated in 1873, the third municipality in British Columbia. Settlement took place along the Fraser River at Chilliwack Landing. Steamboats were the main mode of transportation, carrying goods and passengers between Chilliwack and New Westminster. After the construction of the Canadian Pacific Railway in 1885, many residents began to cross the Fraser River at Minto Landing to catch the train at Harrison Mills. With little room for expansion along the river, the commercial area of the town moved south to the junction of the New Westminster-Yale Wagon Road, Wellington Avenue and Young Road, called "Five Corners". A large subdivision called Centreville was built in 1881. to the city's identity. North side: Also referred to as "Chilliwack Proper Village West", the north side covers the area from the Trans-Canada Highway in the south, to the Fraser River in the north, and includes the communities of Camp River, Chilliwack Mountain, Downtown Chilliwack, East Chilliwack, Fairfield Island, Rosedale and Popkum. Downtown Chilliwack is the historical urban centre of the city. Several cultural attractions, such as the Prospera Centre, Chilliwack Cultural Centre and the Eagle Landing Shopping Centre are located there, as well as key government buildings, such as city hall, FVRD offices, and the Provincial Court of British Columbia. South side: The south side includes the communities of Atchelitz, Cultus Lake Park, Greendale, Ryder Lake, Sardis, Promontory Heights, Vedder Crossing, and Yarrow. Sardis is the urban core of the south side and is a popular shopping destination. Drive east on the Trans-Canada Highway (Highway 1) from Vancouver for about 100 km until you get to the city center. You will see the "London Drugs" and "Cottonwood Mall" sign before Exit 119. Chilliwack has an airport popular with recreational pilots, but no scheduled commercial flights. The closest commercial airports are Abbotsford (YXX IATA), Bellingham Washington (BLI IATA), and Vancouver (YVR IATA). There is one main road in Chilliwack, which has two names. From the highway at Exit 119, running south it's called Vedder Road all the way to Yarrow, and running north it's called Yale Road. Go north on Yale Road, you'll find old downtown, with a variety of restaurants, quaint shops, and some nice parks. Go south on Vedder Road, and you'll pass through the commercial centre of the city, but soon enough you'll be through the city and into the suburbs, where you can find Vedder Crossing, the Vedder River, Cultus Lake, Yarrow, and the Chilliwack Lake Provincial Park. BC Transit covers the main parts of Chilliwack with abouts a dozen routes. Transit is centred on Cottonwood Mall and Yale Road in Downtown Chilliwack. The cash fare is $2 ($1.75 for seniors) in 2018. BC transit also offers bus service from Chilliwack directly to Langley, Abbotsford, Agassiz, and Harrison Hot Springs. Chilliwack Museum and Archives. In the 1912 former city hall on Spadina Avenue, which is a National Historic Site of Canada. Cultus Lake Park. Try in the summer for a refreshing dip or stay in one of the lakefront campgrounds. Weekends tend to be overcrowded. About 10 km south of Chilliwack. [dead link] St. Urban Winery tasting and tours, 47189 Bailey Road, ☎ +1 604 824-6233. W-Sa noon-6PM, Su 1PM-5PM. The vintner, who grew up in Czechoslovakia, works in the European style. Vineyard and winery tours available. [formerly dead link] Cultus Lake Waterpark, 4150 Columbia Valley Way (From Vancouver, get off the Highway at Yarrow/No 3 Road, and follow the signs to Cultus Lake. It will be on your left hand side, a little ways down Columbia Valley Road. ), ☎ +1 604 855-7241. 10AM-6PM. A fun summer attraction for kids and adults, and a nice way to pass a very hot day. Twilight rates are available, and while it's not the sort of place you need to go often, it's a good a one-day outing from much of the Lower Mainland, especially with kids. Best bets are late June and early July, or rainy days, as it can often be very busy. Full pass $22.86. Hike! There are lots of nice trails in and around Chilliwack. A good place to start is the Chilliwack Lake Provincial Park where you can find several trails that are easy to get to by road and of varying lengths. Fishing is popular on the Vedder River. Make sure you're in season and that if you need a licence you obtain one. Licences can usually be obtained at bait shops, and some other places too. Royal Hotel's Royal Cafe, 45886 Wellington Avenue, toll-free: +1-888-434-3388, fax: +1 604 792-2475, e-mail: royalhotel1908@hotmail.com. In the Royal Hotel. Breakfast, lunch, and dinner. Menu on the web site. J Beethoven's Pizza, 4125 Columbia Valley, ☎ +1 604 858-7766. Fantastic pizzeria in the Cultus Lake area. It's pretty well-priced, pizzas are enormous and delicious, and service is really friendly. Probably the best place for pizza in Chilliwack. [dead link] Evangeline's Barbeque and Contemporary Soulfood, 9381 Mill Street, ☎ +1 604 703-1680. Chilliwack's newest restaurant, serving up Creole/Acadian-influenced soul food. Beautiful room, great service, and exceptional food. Located in historic downtown Chilliwack on Mill Street. Boston Pizza, 45305 Luckakuck Way (By Cottonwood Mall), ☎ +1 604 858-3333. The Chilliwack location of a large chain of restaurants, Boston Pizza has good food at decent prices. Bozzini's Restaurant, 45739 Hocking Ave (corner Hocking & Yale), ☎ +1 604 792-0744. 11AM till late. Chilliwack's best casual dining. Open for lunch & dinner. Mandarin Garden Chinese Buffet, lunch, dinner, large selection and very popular. On Luckakuck Way, next to the Freeway and west of Cottonwood Mall. Bozzinis, 45739 Hocking Ave. (corner of Yale & Hocking), ☎ +1 604 792-0744. 11AM - late. Casual dining open 7 days a week for lunch, dinner, & late night snacks. SureStay Hotel by Best Western Rainbow Country Inn, 43971 Industrial Way (off the Trans-Canada Highway at Exit 116), ☎ +1 604 795-3828. Smoke-free hotel, restaurant on-site, free breakfast, indoor pool, wheelchair accessible room available. From $92. 49.06667-121.816671 Riverbend Guest House B&B and Cabin (Riverbend B&B Guest House), 50691 O'Byrne Road (10 km up Chilliwack Lake Road, turn left onto Slesse, Right onto O'Byrne), ☎ +1 604 769-3474. Check-in: 3PM, check-out: 10AM. Less than a 5-minute walk to the Chilliwack River, it is near fishing, kayaking, rafting, sight-seeing, and hiking. Guided fishing adventures on the Fraser River available. From $95. This city travel guide to Chilliwack is a usable article. It has information on how to get there and on restaurants and hotels. An adventurous person could use this article, but please feel free to improve it by editing the page. This travel guide page was last edited at 06:29, on 30 October 2018 by Wikivoyage anonymous user 2001:56A:F290:8900:98C6:F0F5:8CD5:947E. Based on work by Wikivoyage users CommonsDelinker, Wrh2Bot, Ground Zero, Pabfigaro, Traveler100bot, Mx. Granger, Eco84, Traveler100 and JimDeLaHunt and others.